I hope you don’t mind me writing about economics today because, after some comments made during last week's debates, I believe there is a vital point to be made in this Presidential election year. This same topic is the reason for so much superheated debate about global warming. Here’s an example: the late Walt Disney (and, to a lesser extent, his brother Roy) built the Walt Disney Company with a vision of providing wholesome family entertainment. After nearly going bankrupt several times, they succeeded. Given the inflation since Walt passed away in 1966, in today’s dollars he would be a billionaire many times over. And, that is just fine with me. Walt risked his money. No one was forced to buy a ticket to "Mary Poppins" or to Disneyland. He succeeded because he created entertainment that people voluntarily wanted to purchase. He also created thousands of good-paying jobs. At the time of Walt’s 1966 death, he was making a salary of $312,000 per year. In today’s dollars, that would be a salary of $2,243,000 per year. That seems fine to me considering the company was built on his ideas and his risk. Of course, Walt was building great wealth via the 28% of the company he still owned at the time of his death and, again, that is just fine with me. Now, consider the current CEO of Disney, Robert Iger. He makes $43,490,567 per year of which more than $24 million is cash payments (rest in stock, airplane, etc.). His cash compensation is roughly 11 times Walt’s. He was not one of the founders of the company and he is largely insulated from personal catastrophic loss (through insurance, not having to personally guarantee loans, etc.). Disney was recently in the news for replacing U.S. computer programmers with foreign workers. In fact, per their public disclosures, six Disney executives are currently making more than Walt would be after converting his final salary to 2016 dollars. Let me be clear: I am not passing judgment as to whether Mr. Iger earns his salary or not. That is for Disney’s directors or stockholders to decide. They may be pleased the company is saving money by switching to non-citizen programmers. But, from my personal point of view, American society gains much more from Walts than from Roberts. 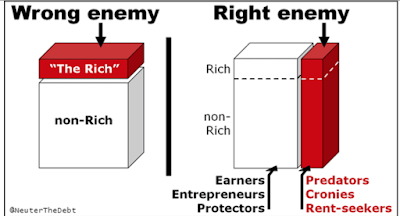 The point of this posting is to explain that railing against “the rich” – without differentiating -- is a very bad idea. From mine, and most economists’ perspective, there are “good rich” and “bad rich.” The illustration below demonstrates my point. From where I sit, many of the problems we have with the U.S. economy is that we have gotten away from free enterprise (capitalism) and morphed into a nasty mix of “crony capitalism,” rent-seeking (the government forcing people to pay unneeded fees, taxes, permits, etc. ), and other parasites that subtract rather than add value to the economy. One of the (many) reasons this blog is so critical of Al Gore is that he has gotten very rich (with a gigantic personal carbon footprint) almost entirely as a rent seeker by using exaggerated science. The fact that, in 2013, he made $100 million selling, to Mideast oil interests (! ), a TV network almost no one watched was predatory influence-peddling at its worst. There is a lot of rent-seeking in solar and wind energy (extra fees and regulations from government forcing the use of “alternative” energy) with global warming as the excuse. This drives up the costs all of us must pay without adding value (a light bulb needs 100 watts of electricity to illuminate and the bulb doesn’t work any better whether the watts come from cheap coal or expensive solar). There is far, far too much of this toxicity in the U.S. economy today and far too little true entrepreneurship and genuine free enterprise. We need to encourage job-creating entrepreneurs and discourage the rent-seekers. If a future Walt Disney should cure cancer by creating a one-dose $50 pill and, in the process, get very rich, that is fine with me! Jobs and tremendous value will also be created along the way. While I have ideas about how to do what I propose, those take us from stating facts and into politics and policy. I try not to write about those topics on this blog except when they directly relate to weather and climate. I simply wish to clarify that politicians merely railing against, and wanting to tax, “the rich” will not get us anywhere. In fact, it may take a bad situation and make it worse.